Let’s hear it for the boys! The recent Milan Men’s Fashion Week showed that the male wardrobe has evolved way beyond the suit, t-shirt and jeans triad. In fact, we too can have a little fun with our fashion selections with retro references, rockstar appeal, and even a little sheen. After following all the major label runway shows, we compiled a 2014 Menswear Trend Report sharing our top picks for what should move on from the runway to street. Of course, being the clean fanatics we are, we shared some care tips for each as well. Activewear: Understanding the active lifestyles of today, top designers introduced a more comfortable, albeit still luxe, side to their lines. Marni upgraded traditional sweat pants and shirts via knitted materials, while Calvin Klein toppers included quilted-satin sweatshirts. 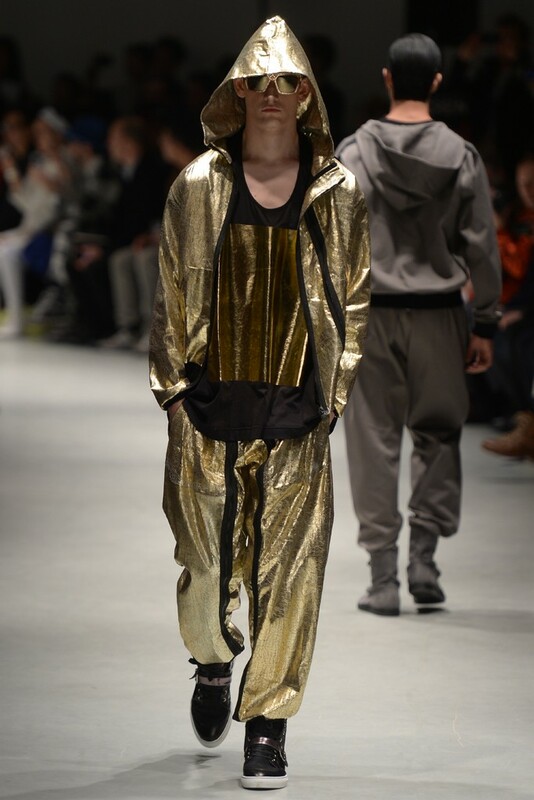 Vivienne Westwood presented three distinct versions of a track suit: one tight and grey, one baggy with black trim, and one a statement in all metallic gold. For knits, be mindful when putting on and taking off, so as not to stretch the neck. A Softer Side: Even traditional suits featured a softer silhouette. 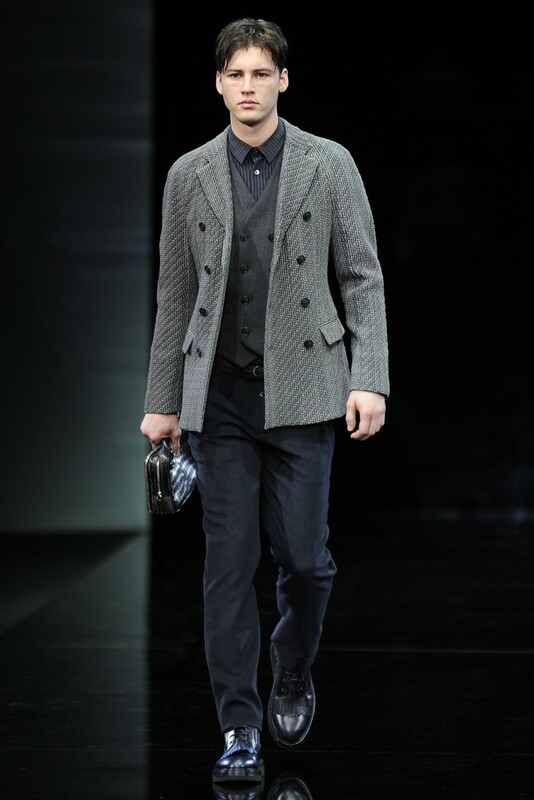 Giorgio Armani fashioned his jackets after the cardigan to make them more relaxed. Tailored pants were flecked with baggier trousers, yet still exuded the fine Italian tailoring. Fabrics included velvet and corduroy. Ensure proper hanging of these garments, using broad or heavily padded hangers to avoid warping. If purchasing a two-piece suit, try to wear and clean together as much as possible to avoid uneven wear of one piece over another. Never iron velvet – it can crush the fibers and leave an imprint. While velvet should be dry-clean only, corduroy can be washed. However, turn garment inside-out before placing in machine. If ironing, run it over the wrong side of the fabric. Rock On: The soft and comfy were contrasted with rock-star influences. Emporio Armani showed biker jackets of ponyskin underneath skinny pants of reflective sheens. Gucci got tight with leather trousers and t-shirts, but also nodded to retro figures with pea coats and greek fisherman hats. The average consumer will probably own only one pair of leather pants, hence take care to find a pair that fits properly, yet comfortably. Before wearing, treat with a leather protector to shield damage from rain… or beer spills. Be selective about your cleaner, choosing one that specializes in leather. Armor: Dolce & Gabbana marched on with 11th century, Norman soldier-inspired gear, including open-faced chain-mail like balaclavas, sheepskin sweaters with Gothic crosses, and silk-covered overcoats painted with references to the Norman period in Sicily. Do not wash sheepskin with a darker colored pelt, as bleeding may occur. Sheepskin can withstand some moisture, though it’s not ideal to have the garment soaked or used in lieu of a raincoat. If this happens, gently blot with a clean towel. Do not rub, as this will force moisture into the pelt. Gently use tweezers to pull out any debris trapped in sheepskin. When wearing silk, be particularly careful of snags from watches, rings or briefcases. 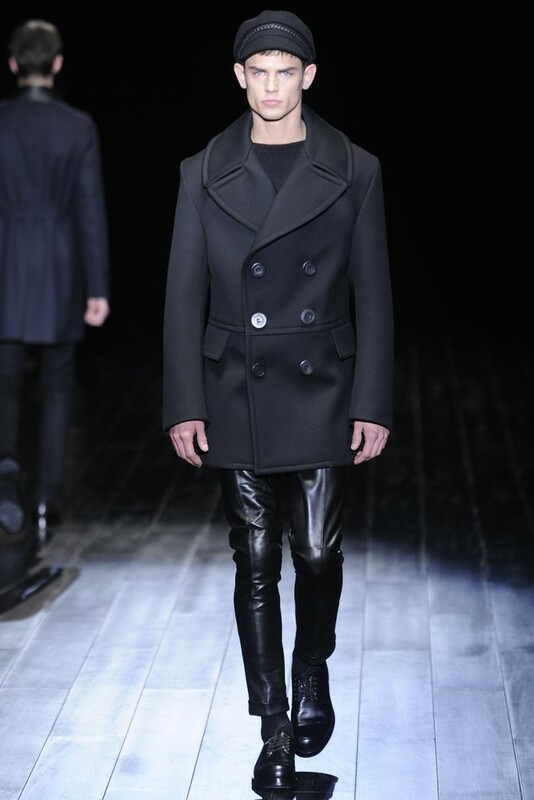 Mixing it Up: In addition to looking good, garments on the Milan runway felt good too. Designers played with unique fabric combinations to create new looks. Flax was woven into cashmere for a bolder silhouette and outwear was refreshed with neoprene bonded to Tuscan wool. Cavalli even created an ombre effect, fusing herringbone and zebra prints. Even if combined with another fabric, do not hang cashmere tops, as they are easily susceptible to shoulder “horns” left by hangers. Cashmere can be washed in mild detergents or shampoo and cold water only. Keep in mind that the material can take days to dry. The material should not be wrung, but laid flat out to dry. Press a clean towel on the garment to help remove excess water. While neoprene can traditionally a tougher material, it is usually best to dry clean wool. Gentle washing is possible, but understand it could result in shrinkage and/or loss of the material’s softness. When pressing wool, set use steam heat only, never dry. Remember, among Sudsies’ specialties are designer garment and couture care processes. So feel free to leave the dirty work to us, so you can just focus on looking good. Now, that’s a trend worth picking up!